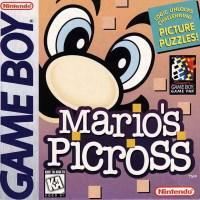 One of the first Picross video games. There are 192 puzzles played with Normal rules, giving time penalties for mistakes made. After completing these, a further 64 puzzles are available in “Time Trial” mode, which follows Free rules but also randomizes the order of the puzzles. The only assist available is Hint Roulette, which unfortunately can’t be disabled completely - if you don’t want it, you have to say “no” to it (which is not the default option) every time you start a puzzle (outside of Time Trial). While it’s well put-together, it’s hard to recommend as an entry point today unless you’re truly trying to get all the Picross you can or want to see how the games have evolved. The limitations of the Game Boy hardware mean that puzzles never get larger than 15x15 and everything is controlled with buttons. The later DS and 3DS Picross games make use of the touchscreen and stylus for a much smoother experience and sometimes larger puzzles. I Stopped Playing When: I finished the non-Time Trial puzzles, and misunderstood Time Trial and thought it was randomly picking from the same pool of puzzles I’d already completed. That wasn’t interesting to me, so I moved on to other Picross games - after which the thought of going back to Picross without a touchscreen was quite unappealing.